A weightless anti-ageing moisturiser for oily skin. This weightless moisturiser with SPF 50 combines superior UVA/UVB protection with soothing, plant-based antioxidants that help fight the signs of ageing and protect skin from environmental damage. With a soft matte finish, this lightweight lotion leaves skin smooth, hydrated and younger-looking. The product itself is awesome. Lightweight, I can easily use it on top of my regular mosituriser (I use this for the SPF only). It doesn't irritate or clog up my skin. But, the (new) packaging should be improved. After only a few weeks of use, it leaks product from the seam between the bottle and the head. A sunscreen you can't safely keep in your purse is far from optimal. Please, PC - fix this and you'll easily get a five star rating. Customer Care: Hello, and thanks for your comments! We are always looking for ways to improve our products, so we will pass along your feedback to our Product Development team! Unfortunately, it’s the first PC product that really disappointed me. I started using them 2-3 months ago and was amazed by the changes it made to my skin. I decided to add this fluid to my daily steps and now my face needs to recover from trying to make it work (twice). Main issues are pore clogging (just when I had blackheads under control), excessive T-zone shine and burning skin on my cheeks. It’s great that PC offers smaller product sizes so that I could try it and now can order something else with hopefully better results. Customer Care: We're sorry to hear of your experience, it’s difficult to say exactly what may have caused your reaction. Skin is never static and may respond differently due to factors like the weather, UV damage, active ingredients etc. Please contact our team for advice in this matter. (BTW You can find the expiry date of this product in the rim of the tube). I really love the product, but also I really hate the delivery charges way too high (and the free delivery over 150 euro ..... seriously). I hope for some free delivery promotion for EU countries. I tried other brands of liquid sunscreen, and although many of them had good performance, most of them had at least one fatal flaw, not the least of which was that they were terribly irritating. After received response of Client Service of PC's Europe, i tried this trial size. And it's amazing. It's the best fluid for morning with high SPF. I like using it in the winter. My face is always hydrated and i don't need another sunscreen. The product is a thin liquid lotion, white in color, with a mild scent. It spreads easily on skin and soaks in quickly. It is non-irritating and lightly hydrating. It dries shiny on my skin, but that is easily remedied with a mattifier such as PC Shine Stopper or other matte cosmetic products. Overall, highly recommended, and I definitely will repurchase! This stuff has done miracles for me. I do combine it with other PC products, but I can not do without this. It helps protect my skin from the sun, does not have any white cast, it's so easy to apply your really just need a small amount, and makes my skin look more even and smooth throughout the day. Side note: if you like a super matte face - this might not be for you. It might just be my skin type but my face looks a bit glowy, which I personally love. I tried the trial size and I had to buy the regular size! It is wonderful. No white cast and very easy to apply! The long term results are still hard to see, since I have not used it for that long, but I will update you on that as soon as possible. I find it hard to find moisturisers with good active ingredients AND a high SPF that's vegan, most SPFs for the face that range between 50 and 100 are just regular sunblocks. This moisturiser is very thin and runny, so be careful when applying. It sinks easily into the skin and a little goes a long way - but I always apply liberally to get full coverage SPF. There is no white marks or residues and the bottle itself has lasted me 4 months and there is still some left that will probably last another month. However, I wouldn't say that it has a matt finish since there's a slight shine after, so it's more velvety or silky, but the effect doesn't last long so if you got very oily skin this might not be the best. If you got a regular t-zone problem then some blotting-papers will be more than enough throughout the day. 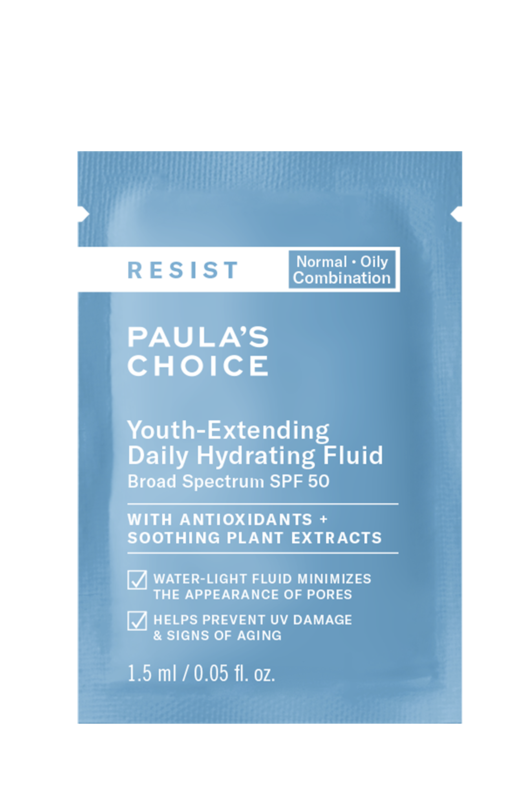 I bought a trial size of this after hearing all about Paula's Choice skincare and how it had changed so many people's skin, although I usually prefer my products to be mostly on the organic/natural side on the spectrum. But oh am I glad I did ! I am now using the full size item. This will do absolute wonders if you have truly oily skin or combination skin with a pretty oily T zone. Previous to this I had tried a bunch of oils and moisturizers, with a consistant AM routine and I have never, ever found something that controls my oils the way this moisturiser does, it is truly a game changer if you are someone who needs to blot several times a day like me. The texture is very fluid, almost liquid, and penetrates very quickly into the skin. The SPF 50 is really nice and a step up from most moisturisers. I would still recommend using a dedicated sunscreen to be extra sure your skin is protected, especially if you are using the retinol serum, but if you are someone who prefers a short routine, or you just don't like layering products this is definitely for you. Additionally, it goes very nicely under foundation or primers. I have had no problems putting makeup on top of this after waiting a minute or two. This only downside to this product that I can think of is that it is rather drying, hence why I would only recommend this for truly oily skin types, or for people who have a pretty extensive skin care regimen (ie. layer serums, etc). I have combination skin and if I use this on its own right after cleansing, my skin can feel somewhat tight. I also would stay away from this if you have a dehydrated oily skin type, or use it but layered with a hyarulonic acid booster first. Would buy this again in a heartbeat ! SaraC - Too Strong For My Skin? Customer Care: Thank you for sharing your experience with us - we're sorry to hear this didn't work as expected for you! Please contact a member of our Customer Care team, who can assist you with a possible alternative. I bought the product in April, and liked it, in particular for summer as it doesn't trigger breakouts. However I quickly started feeling it irritated my skin especially under the eyes. Paula's team was very kind when I contacted them, we both decided it was due to the chemical sunscreen, and they advised me to try another product which suited me better, with natural sunscreen,namely the Resist anti-aging moisturizer SPF 25 (perfect for me in winter but too rich for summer) However,I hadn't checked the list of ingredients contained in Resist anti-aging Youth-extending hydrating fluid SPF 50 carefully enough and upon doing that today I now know the irritation is due to Chamomille as I'm allergic to both chamomilles (the Matricaria and the Anthemis varieties). I'm really grateful to Paula's team for bearing with me on the choice of products and even sending me samples to find some products more adapted to my skin. However, I'm surprised they use chamomille in some skincare products as it is well-known to cause allergies in sensitive persons, just as lavender does. I'm also disappointed because I checked the new Resist anti-aging smoothing primer serum SPF 30, which I find very tempting, yet it also contains Chamomille so it's impossible for me. I do recommend the product to non allergic people with oily or combination skin. Customer Care: Thank you for your review. We are happy to hear that you were able to find a more suitable product for your skin type and condition. Chamomile is a great ingredient but those intolerant to other plants from the daisy family could also be intolerant to this ingredient unfortunately. We're happy to confirm though, that we do not use lavender (from the mint family) in our products due to being a potential sensitizer. I have bought this moisturizer two times and it works. I have extremely oily skin and the first time I used it I hated it because it made me even more oily. Then I invested in a more serious regimen and started to tone with PC RESIST Weightless Advanced Repairing Toner, exfoliate with PC SKIN PERFECTING 2% BHA Liquid Exfoliant, apply the PC serum RESIST Super Antioxidant Concentrate Serum and THEN apply this moisturizer and now I love it. It is strange because this product used to turn my face into an oilslick and make my makeup come of but in conjunction with the other products its the best moisturizer with spf for oily skin. Looks wonderful under makeup. I expected more from this product. First, cream package broke inside the tube after several uses and now it is really uncomfortable to use it. Second, I can't apply foundation over this moisturize because white rolls from cream appear. I tried to wait a bit more before applying the foundation, but it wasn't better.My foundation is also from your Brand and with other moisturizes I didn't experience this "rolls" issue. I will definitely not buy this product again. Customer Care: Thank you for your review. We are sorry to hear that this product has not worked out for you. Our team will be contacting you soon to find an alternative product. axelle - Great product until package broke apart!!! I was very happy with this product and with all Paula's product in general. I even recently re-ordrered but am regreting it now. Unfortunately, the cream package recently and suddently broke apart inside the tube, at the base of the tube inside the bottleneck. So each time I am opening it, I am loosing half of the cream and it is leaking everywhere on my hands, clothes, a real disaster. I am very unsatisfied given the price of this cream. The cream is not tested in animals and that is good. But maybe the packaging should be tested on humans and designed to last more than 2 months. how could something happen with such a brand? It is the first time in my life that something like that happens with a cream. I was becoming a good customer but might reconsider my next purchase seriously. Customer Care: Thank you for your review. We have already been in contact with you regarding this issue. I had been looking for a long time for a moisturizer with high SPF to use in the warm months since I have olive skin with freckles and can be exposed to a lot of sunlight. All the ones I tried before this one left my skin (which is normal to combination) incredibly oily and shiny or didn't have enough SPF. So in that context this product is AMAZING and I would recommend it. It is very easy to apply and doesn't leave my skin oily or shiny at all, even in hot weather. However, in colder months I've found out that this product leaves my skin feeling tight and dry, specially in the cheeks and forehead. Furthermore, it may have been a fluke but after 1 month of use the container started cracking near the spiral to screw the lid and I had to change it to another container to avoid getting moisturizer all over my hands and wasting it every time I used it. For these two last points I give it 4 starts instead of 5. Customer Care: We advise you to contact Customer Care for assistance on your packaging issue. I have an oily T-zone, and this makes it worse, does not mattify at all. I am disappointed, as I had high expectations. Previously I have used Hydralight moisturizer SPF 30 and it is more mattifying. So it would be good to be able to buy a sample first. Glad it works for some though, I have to keep looking. Customer Care: Please contact Customer Care so we can look into this matter with you. Pros: it moisturizes the skin perfectly, it leaves no oily smudges on the skin and it protects from the harsh summer sun. Great for oily/combination skin, it's about as fluid as the treatment serum, goes right into the skin and doesn't leave traces behind. The skin is more bouncy and well-hydrated without being over-burdened nor sticky. Cons: it does leave a slight shine because there's no tint in it. It doesn't mattify as much as I expected. Before this, I have successfully used the RESIST SUPER-LIGHT DAILY DEFENSE SPF 30, since it has a slight tint in it (it is amazing, by the way) but I decided to try this one out too, since it's from the same range. The best look for me is achieved by complementing this fluid with a compact powder. It adds a mattifying effect but the glow from the fluid isn't completely faded out so my skin has a healthy, non-grease induced, natural glow. I have had no issues with acne, blemishes or red spots which were normally caused by sweat and grease-blocked pores during the summer. I would strongly suggest you get a sample to test it out for yourself and see what it's like, since you may be expecting the same instant matte effect as I was. This is very much a hit or miss, depending on what you're expecting. After all, it's a non-tinted moisturizer, not foundation. Danielle - Cannot Fault this Product, Utterly Impressed. A Must Have!! Sorry but I hate this product. I had great expectations due to the good reviews I read from the american site. The formula is the same as the "Clear Ultra-Light Daily Mattifying Fluid SPF 30+" so the same effect occurs. It makes my face shine A LOT even applying only a thin layer. Probably the worst product here keeping the skin matte. OK the texture is nice bcz is like water and very easy to spread. Ingredients also seem awesome as usually but I expected something really matte for a product for oily skin. I know chemical sunscreens are difficult in this way but the "Skin Balancing Ultra-Sheer Daily Defense SPF 30" and even the "Extra Care Non-Greasy Sunscreen SPF 50" do better work at keeping your skin matte. Wouldn't be possible to include the same "anti-shine" ingredients like in the "Skin Balancing Ultra-Sheer Daily Defense SPF 30"?, or the Microsponge technology (not as an independent pricey second step)?. Thanks. Help to protect skin against harmful free radicals, among others caused by sun light and pollution. They have anti-ageing properties and calm skin. Possess potent antioxidant and skin-soothing properties and has impressive research in terms of its many benefits for skin, including anti-ageing properties. Aqua, Ethylhexyl Methoxycinnamate (Octinoxate, 7,5%, sunscreen), Glycerin (hydration/skin replenishing), Ethylhexyl Salicylate (Octisalate, 5%, sunscreen), Silica (absorbent agent), Octocrylene (2%, sunscreen), Butyl Methoxydibenzoylmethane (Avobenzone, 2%, sunscreen), Dimethicone (hydration), Tocopherol (vitamin E/antioxidant), Chamomilla Recutita (Matricaria) Flower Extract (antioxidant), Vitis Vinifera (Grape) Seed Extract (antioxidant), Camellia Sinensis (Green Tea) Leaf Extract (antioxidant), Camellia Oleifera (Green Tea) Leaf Extract (antioxidant), Peucedanum Graveolens (Dill) Extract (antioxidant), Sambucus Nigra (Black Elderberry) Fruit Extract (antioxidant), Avena Sativa (Oat) Bran Extract (skin-soothing), Punica Granatum (Pomegranate) Extract (antioxidant), Lycium Barbarum (Goij) Fruit Extract (antioxidant), Hydrogenated Lecithin (skin-restoring), Titanium Dioxide (texture-enhancing/texture-enhancing), Dimethicone/Vinyl Dimethicone Crosspolymer (hydration), Diethylhexyl Syringylidenemalonate (hydration), Hydroxyethyl Acrylate/Sodium Acryloyldimethyl Taurate Copolymer (film-forming/suspending agent), Xanthan Gum (texture-enhancing), Sodium Carbomer (texture-enhancing), Benzyl Alcohol (preservative), Sodium Benzoate (stabilizer), Potassium Sorbate (stabilizer), Phenoxyethanol (preservative). What is the main difference between Resist Anti-aging Youth-extending Hydrating Fluid SPF 50 and Resist Anti-Aging Super-light Wrinkle Defense SPF 30? Resist the Hydrating Fluid SPF 50 has a fantastic light texture that is ideal if you have oily skin prone to breakouts and blackheads. Resist Super-Light SPF 30 is formulated with a mineral sunscreen, which makes it more suitable for people with sensitive, oily skin. The mineral filter provides a slightly more mattifying effect than Resist Hydrating Fluid SPF 50. Resist Super-light SPF 30 has a touch of colour to help skin look more even-toned. 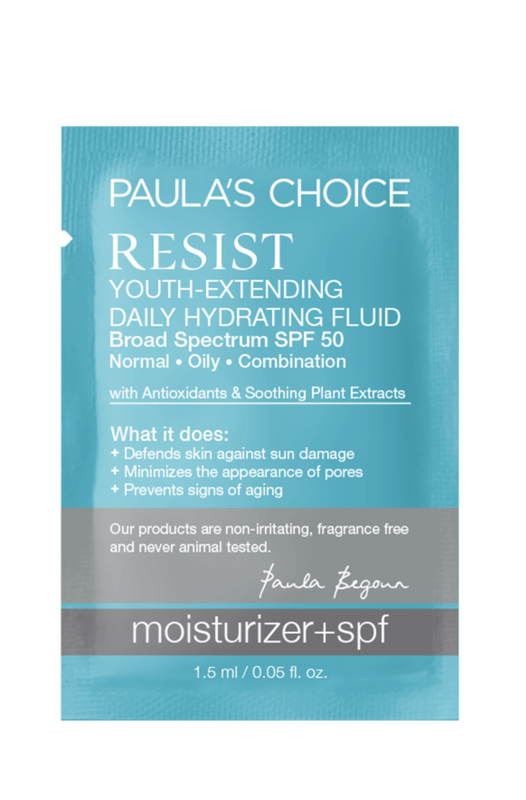 Is there another Paula's Choice product which is similar to Resist Anti Aging Youth-Extending Fluid SPF 50? Our Resist Anti Aging Youth-Extending Fluid SPF 50 is identical to our Clear Ultra-Light Daily Mattifying Fluid SPF 30+, except for the SPF coverage.